Our most popular winter adventure– snowshoeing Glacier National Park. A favorite for families, photographers and wildlife enthusiasts. Snowshoeing Glacier National Park in winter is magical; snow hanging in the cedars, frozen lakes, waterfalls and desolate peaks create a landscape unlike any other. Snowshoe tours are available on either the west or east side of the Park, giving you the option to tour old-growth forest or travel over windswept alpine meadows. We offer full snowshoe and ski pole rental out of our office. Tours will generally lead to a scenic lunch spot, followed by hot drinks and group photos. Our guides are fully trained in preventing and treating cold-related injuries, and will keep you and your group out of harm’s way. Day trips: Meet at the Glacier Adventure Guides office at 9 a.m., where we will drive to the trailhead in Glacier National Park to begin the day. We also offer a shuttle service to pick guests up from their lodging at 9 a.m. Full day snowshoe tour, return to Columbia Falls before 5 p.m.
*Trip duration can be as short as four hours, depending on guest preferences. Due to potentially long drive times to the trailhead, we do not offer half-day rates for trips into Glacier National Park. *Izaak Walton Inn Guests: Meet downstairs at the guide kiosk at 9 a.m. Load up and head to the trail in Glacier National Park, full day snowshoe tour, return to the Inn around 4 p.m.
*Shell pants: hard shell or soft shell. Side vents are optimal. *Hard shell jacket: waterproof and breathable, no insulation. Glacier Adventure Guides leads snowshoe tours to the west and east sides of Glacier National Park, depending on conditions. Many of our tours are highly flexible and great for any age or fitness level. Views of the Apgar Range from Rocky Point. Tour the west shore of Lake McDonald on a winter trek to Fish Creek. This tour leads you past the historic shareholdings and cabins of Lake McDonald, out to the Camas Road and on to Fish Creek. Snowshoers have the option to continue from Fish Creek campground out to Rocky Point, one of the most scenic spots on Lake McDonald. This tour leads snowshoers across quarter circle bridge and up the trail to the fire lookout on the summit of Apgar Mountain. This is the nearest mountain above West Glacier and offers tremendous summit views of Lake McDonald and the peaks of Glacier’s west side. A great trip for those looking for a challenge with rewarding views close to town. bridge at upper McDonald Creek. 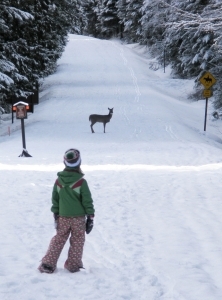 Our most popular snowshoe tour. Tour the shore of Lake McDonald and McDonald Creek, have lunch by the roaring waters of the Sacred Dancing Cascade, and finish the day with a pleasant stroll along the Sun highway. Easy access and mellow terrain make this an ideal family outing. The view of the basin from upper Snyder Lake. Snyder Basin’s remote feel, deep snow and dramatic relief make this a guest favorite. Tour from McDonald Lodge up the Sperry Trail, a long gradual ascent into the basin. The cirque surrounding Upper and Lower Snyder Lakes is popular with local ice climbers for its spectacular ice falls. This is a brilliant out-and-back and is a worthwhile challenge. High winds whip the summit of Mt. Brown. Viewed from Mt. A guide favorite, Mt. Brown Lookout offers huge views for those fit and motivated enough to make the journey. This tour leads snowshoers up the south slopes of Mt. Brown and into the alpine. Views from the fire lookout are tremendous, with views of Heaven’s Peak, the Great Bear Wilderness and the entirety of Lake McDonald. This tour requires participants to carry shovel, avalanche beacon and probe. This out-and-back tour on the southern tip of Glacier leads snowshoers along part of the Boundary Trail, one of the Park’s longest continuous trails. Guests have the option of continuing on the low-angle Park Creek Trail or adventuring up the Boundary Trail. Views from the trail include the southern Great Bear Wilderness, Mt. St. Nicholas and the Essex area. A perfect Glacier Park tour for guests staying at the Izaak Walton Inn. 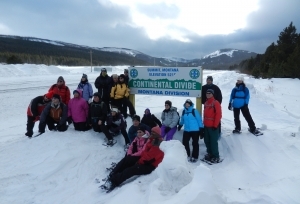 Group photo at the Continental Divide, Marias Pass. For cloudy or stormy days on the Park’s west side, this is your best option to see the sun. While windy, Autumn Creek and Marias Pass have many more sunny days during the winter. Easy touring across rolling, wind-scoured terrain make this a popular tour. Snowshoers will pass through lodgepole pine forests and trek the foothills below Glacier’s massive front range. From these slopes are big views of the great plains and nearby peaks. Flexible tour options and good weather make this an excellent group destination. The town is a short drive from the North Fork of the Flathead River, and is surrounded by the Whitefish, Livingston and Swan mountain ranges and several national and state forests. “C-Falls” is a prime destination for skiing, hiking and camping. Adventure lives here! Missoula International Airport (MSO): 2 hrs. Transportation from lodging to office (shuttle rates: $75 from town, $125 from Whitefish Mountain Resort). All participants must read and sign an Acknowledgment of Risk Waiver and agree to our Reservations and Cancellations Policies. •	OFFERED: DEC. - MAR.